A patent titled Content Creation Using Electronic Input Device on Non-electronic Surfaces normally wouldn’t inspire much excitement. But since it’s Apple working on this mysterious 'input device', the design has immediately generated some excited buzz. Netherlands-base site TechTastic was the first to spot the patent, which details a stylus that can write on any surface, then send the data to any device. Engadget reports that the patent was filed last July and made public this January. The Claims section of the patent suggests that the device will communicate wirelessly with an external sensor, which will be able to track stroke duration, force against a “non-touch-sensitive surface”, three-dimensional motion and orientation, and “plurality” of strokes. All of this data would be communicated via some sort of “radiofrequency or acoustic signals” to the sensor. With this stylus, you wouldn’t need a touchscreen or expensive tablet for digital sketching, writing or designing. Jotting down notes on PowerPoint slides during a presentation or sketching a design to your desktop with the accessory would be an exciting option for a lot of users. What’s especially intriguing is the potential scale of this device. The image above shows a pair of sensors attached to your device, measuring your writing inputs fairly close to the screen. But Figure 14 (below) portrays a more VR-centric design, with sensors all around the room. VR games like Google’s Tilt Brush for Oculus Rift and HTC Vive rely on room sensors and touch controls, allowing users to sketch 3D images in mid-air. Apple’s stylus would not only port to 2D screens, but could also theoretically work as an accessory for the (still very much) rumored Apple augmented reality glasses. Users would draw 3D designs while being able to see their surroundings for inspiration. Based on the fact that the device sends signals to the sensors, we’re speculating that the stylus could have some kind of built-in accelerometer, similar to what's found in motion controllers like the Oculus Touch. Or, the stylus could primarily signal its force against surfaces, while the external sensors kept track of its 3D positioning. At this point, we can only guess. 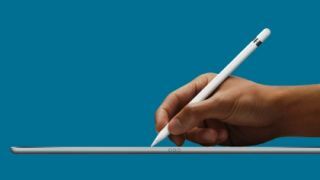 The Apple Pencil currently only works with the iPad Pro, although patents last year led us to speculate that the Pencil 2 will work for the iPhone as well, and release in 2019. But, another figure from the more recent patent shows the stylus connecting with an iPad, iPhone, Watch and even an iPod. If the latest patent reveals a third or concurrent Pencil design, it could be Apple device-agnostic. Apple is hardly known for backwards compatibility with its peripherals and wires, so this could be an exciting addition for longtime Apple shoppers who own older devices. We have no way of knowing if Apple’s new stylus design will ever see the light of day, but we’re certainly excited about its potential applications for 3D and AR design, and its utility in virtually any environment.